In genealogy, as in everything else in our lives, There Is No Such Thing As A Free Lunch. And, The Legal Genealogist regrets to report, sometimes lunch gets downright expensive. As all of us who need records from the United States Citizenship & Immigration Services (USCIS, formerly INS) are about to see, and in the very near future. USCIS has proposed a major increase in its genealogy program service fees and, while the proposal is only in the proposal stage right now, the likelihood that the fee increase won’t happen is somewhere between zip and zero. So we need to be prepared — and, if we can, to act now, before the fee increase takes effect. USCIS holds some of the most genealogically valuable records on the planet if we have immigrant ancestors who came to the US or created immigration- or naturalization-related records in the 20th century. These include the Naturalization Certificate Files (C-Files), from September 27, 1906 to March 31, 1956; Alien Registration Forms (Form AR-2), August 1940 to March 1944; Visa Files, July 1, 1924 to March 31, 1944; Registry Files, March 1929 to March 31, 1944; and A-Files, April 1, 1944 to May 1, 1951. See this USCIS page for an overview. All of those fees, under the proposal filed for public comment by USCIS on May 4th, would go up to $65: $65 for the initial search request; $65 for the copy from microfilm; and $65 for the copy from textual records. Now of course this really is just a proposed rule at this point. You can certainly send a comment in to USCIS on the proposed rule and try to convince them it shouldn’t happen. The rule announcement is on the Federal Register website here. 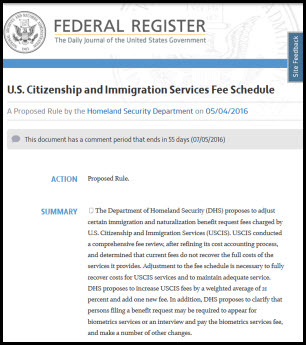 We all have another 55 days to tell USCIS what we think of this proposal. But — seriously — the chances of this not going through even if every last one of us rose up in unison are essentially nil. This fee increase will take place. The rule proposal makes it clear that USCIS thinks the real cost of providing these records is considerably higher, if all administrative costs had been factored in, and that we’re getting a break by holding the increase to the $65 level. So feel free to comment if you choose… but cover your bets right now. In short, if you’ve been holding back and waiting to make a document search request or waiting to order USCIS records, now is the time to get your request in. To make a search request to produce any and all records citations for your person — and you can’t order a record without the record citation number — head over to the USCIS genealogy program web request page right now and pay the current $20 fee to get the request in. And note that the page says the request page will be down today (May 11th) between 6 p.m. and 9:30 p.m. EDT. If you’re really really lucky — and there are no guarantees here because some search requests have been taking a very long time — you’ll get the records citation report back before the new fees go into effect and you’ll be able to then go ahead and order the records themselves from microfilm or textual record before the new fees take effect. Don’t count on this — I’ve had one search request pending since October 26, 2015, with no response. But at least act now to make your search request. No matter what happens with the fee proposal, it can’t take effect before the comment period expires on July 5th, and that means you have that long for sure to get a search request for $20 rather than $65. As a result of this price increase, will USCIS actually answer their phone (it always goes to voicemail–without the calls being returned)–or will they answer emails about long-ago (paid for) search requests? So if my immigrant ancestors arrived before 1906, should I assume that I would not benefit from a search of these files? It’s not the arrival date that’s critical, it’s the record date. You could have someone who came in before 1906 and still created records after 1906.